In another sign of a strong recovery in America's manufacturing sector, the after-tax profits of U.S. manufacturing corporations reached a record-high $159.7 billion in the second quarter of 2011, according to data released today by the Census Bureau. Adjusted for inflation, second quarter profits this year were 9.1% ahead of the previous quarter, and 40% ahead of a year earlier. 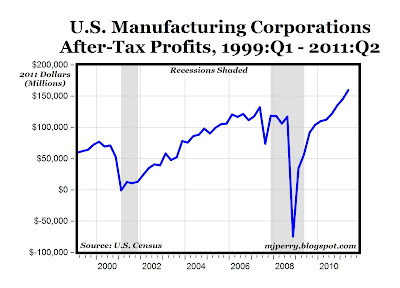 Compared to the pre-recession profit level of $124.1 billion in the fourth quarter of 2007, manufacturing profits have increased by 28.7% and $35.6 billion. I think we can now safely say that the profitability of the U.S. manufacturing sector has made a complete and total V-shaped recovery from the effects of the U.S. recession and global slowdown, and is now well-prepared and situated for a new cycle of growth and expansion in output, sales, jobs, R&D, and capital investment. It's also more evidence that American manufacturing is at the forefront of the U.S. economic expansion. And who doesn't like a "cheap" dollar? I prefer to all it a "trade-enhancing" dollar. A few weeks back, "Morganivich" pontificated that "wireless charging" of battery-powered tools or cars was simply impossible, due to laws of physics only Morgan understood (like his economic policies). Well, Audi is doing the impossible. Audi urban concept with support for wireless charging. Audi is introducing a 1+1 urban concept technology study for urban and metropolitan areas. The electric-powered show car has four wheels, combines elements of a racecar, a roadster, a fun car and a city car, and weighs just 480 kilograms (1,058.22 lb). The cabin of the Audi urban concept offers slightly offset seating for two; the roof slides back for entry, and the canopy can remain open in good weather. Audi says the technology study is targeted toward people who are interested in technology and are enthusiastic about new approaches to mobility, independent of their age and status. In particular, it addresses an urban public whose lifestyle both reflects the car’s modern concept and the driving pleasure associated with it and is a good fit for a possible innovative leasing system. The battery is mounted transversely behind the seats. The lithium-ion battery, which weighs around 90 kilograms (198.42 lb), stores 7.1 kWh of usable energy. The study’s two electric motors together produce 15 kW (20 hp) of continuous power and 47 N·m (34.67 lb-ft) of torque. The motors are mounted between the rear wheels, which they drive via a single-speed transmission. The Audi urban concept accelerates from 0 to 100 km/h (62.14 mph) in 16.9 seconds. It reaches 60 km/h (37 mph) in around six seconds. Top speed is governed at 100 km/h (62 mph). Range in the European driving cycle is 73 km (45 miles). The battery recharges completely in about 20 minutes with 400 volt three-phase current, and in approximately one hour with 230 volt household current. Audi Wireless Charging. Audi Wireless Charging (AWC) refers to contactless induction charging. The infrastructure side, comprising a coil and an inverter (AC/AC converter), is placed on the normal parking spot of the Audi urban concept and connected to the power grid. The 3.6 kW primary coil set into the plate generates a high-frequency alternating field. The charging process begins automatically when the urban concept drives onto the plate. The alternating magnetic field of the infrastructure side induces an alternating current across the air gap in the secondary coil, which is integrated into the vehicle. This current is rectified and fed into the vehicle’s electrical system, where it charges the battery or powers consumers such as the heater. The alternating field is only generated if the vehicle is standing over the plate and thus poses no danger to people or animals. Charging stops automatically when the battery is fully charged. The driver can interrupt charging at any time. The efficiency of AWC is comparable to that of other charging technologies. It is not affected by rain, snow or ice. The new technology makes charging electric vehicles easy and extremely convenient. A later version of the technology will be able to be integrated into the transportation infrastructure as a retrofit for parking garages or residential streets, for example. i'd be interested to see how they define "manufacturing company". i suspect they are including platform companies like apple and IBM that don't do their own manufacturing. "Audi Wireless Charging. Audi Wireless Charging (AWC) refers to contactless induction charging." this is a completely different technology. this is just short range induction, the same kind an electric toothbrush or razor uses. it's old tech, been around for decades. it has nothing to do with the broadcast power we were discussing last time, which is an utter pipe dream. even this induction charging is going to be highly wasteful. you'll be lucky to get half the power into the car you put into the charger. that doesn't matter much in a razor, but for a whole city of cars it would be a serious issue. yes... we have a very serious unemployment rate and employers saying that they won't be hiring even with corporate/payroll tax cuts because there is no demand for what they produce - no aggregate demand because ..."hello" with a high unemployment rate.. people don't buy "stuff". so what is it the manufacturing sector is "manufacturing" and who is buying it if the unemployed are not? It seems that after every post, the doubters chime in. As in "I'd be interested to see how they define "manufacturing company"." What does it matter? It's a comparison and the comparison clearly shows a V-shaped rebound in profits (not necessarily revenue or employees however). Profits usually lead to expansion. Does your UFO fly on contactless induction or some other method? does proving over and over again how stupid you are fulfill you in some weird way? i'm really baffled by why you bother with this. get shot down by the facts. resort to irrelevant personal attacks or appeals to authority because you cannot comment on the substance of the matter. here we see another fine example. you are as predictable as you are ignorant. Manufacturing employees, that qualify, are very happy they are be able to take home part of the profits. I wonder how many union members regret not having profit sharing as part of their bargained package? Very few expected Manufacturing to be source of strength in this slow economy. I am glad it is still a major contributor to the U.S. econ.
" Profits usually lead to expansion." what is selling in an economy that has 8% unemployment? that's why I ask ... what kinds of manufacturing are selling "stuff" in this country? or is this an indication of an increasingly split population of haves and have nots? no one I know thinks 8% unemployment is healthy... right? So consumption spending has rebounded (as per an earlier CD post), and manufacturing has set new record profits. People are buying, companies are building. Nobody's hiring. GDP is just above flat. Huge Trade Deficit from Petroleum. Manufacturing only employs a small % of the workforce, but Everyone buys gasoline. Manufacturing, and Export are the good news. Lack of investment in even more efficient plants due to inane Corporate Tax Laws, and heavy dependence on imported oil are the bad news. "...and heavy dependence on imported oil are the bad news." Why do you think imported oil is a problem? Do you think domestic is cheaper? You know that, uh, you can find almost any info online, right? The answer as to how manufacturing is defined in this article. Just because the answer's not in what you read doesn't make looking for the answer off limits. This isn't a test, you can use your books and that incredible database of information at your fingertips. You take time to post speculations about what the data may or may not contain. Yes, they are questions, but they add nothing to this issue other than leading people away from it. I don't think you find it interesting how it is "they" define "manufacturing company". If you did you'd take an interest in finding it out. Instead, your interest (I mean this with the utmost respect, please don't let my bluntness distract you from the content of my words) is continuing to talk about a topic about which you still have questions and can find the answers to but choose not. Instead, you continue to talk about it, aware of the hole in your info. Your questions are good ones (except Cabodogs... see the end of this post for that""), but when you have them, don't post them if the answer's easily available, then you don't care, and are trying to do something related to your own identity, again, under the rubric of participating in something else. That, bothers me. Because it's everywhere. And it's sad because the ease with which we can find information, and do it quickly, is... is... I mean, Jesus, a post on U.S. Manufacturing, at least two people question what it is that's being manufactured, and nothing! This is a blog for crying out loud! You need the internet to read it! Please don't respond. This is not about defending your egos people. Instead, take in what I've said, move on, get the info, and post it here if you post anything at all. Cabodogs: "Why does it matter" question. Clearly profits don't usually lead to expansion, unless you've been living in another country the past few years, which is exactly the point. Yes, it's an apples to apples comparison, but knowing what's being manufactured matters, as well as where it's being manufactured. 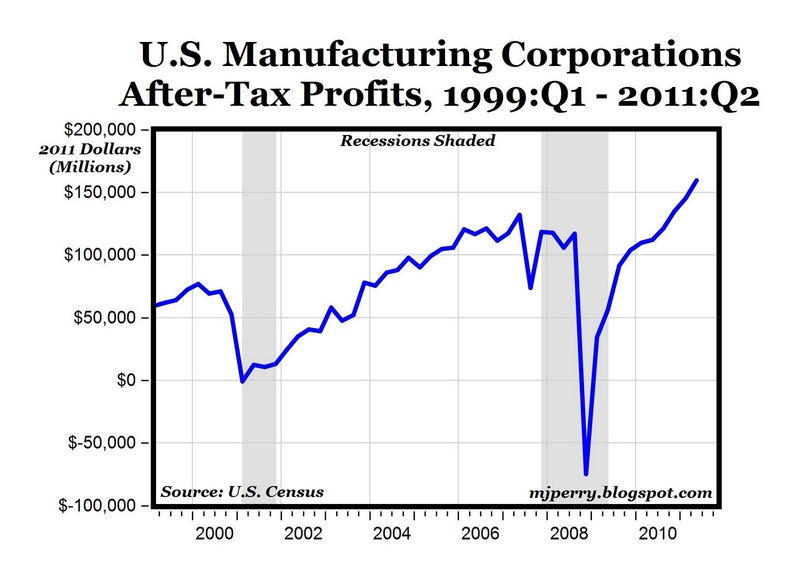 In case you missed it, this post describes profits by U.S. manufacturing corporations. Me making more money selling more zippers throughout the world means I might have to keep my machines on a few more hours each week. Reduce my corporate taxes. I don't need it though, cause I'll just pay my employees a few more hours each month, which I can afford anyway with the record profits I'm making.